The Silver Star Families of America is a non-partisan, not-for-profit charitable organization committed to supporting the United States Wounded Military Members and Veterans from all wars, past and present, and honoring their sacrifice with Silver Star Banners. SSFOA reserves the right to conduct the day to day business of the organization as they deem appropriate. State Coordinators and Reps will be chosen at the discretion of SSFOA National Headquarters. Silver Star shining for sacrifice, honoring wounded, ill and dying members of our Armed Forces and bringing remembrance to those so deserving of our thanks. Your guidance, leadership, and perseverance have given our program an invaluable blessing and I am personally so very humbled to be part of this team effort to help bring honor and to help preserve the dignity to our combat wounded and ailing American Veterans. Thank you and may the Lord continue to use your organization to sharpen others just as iron sharpens iron." I am proud and honored to do this for the Silver Star Families of America. Consider it done. The National League of Cities fully supports the Silver Star Families of America initiative and will communicate to our members and ask for their support for Silver Star Service Banner Day. "The Big Four service organizations were asked if they had any problem with Indiana adopting the Silver Star Flag as the flag for the wounded ~ the response was a unanimous endorsement." 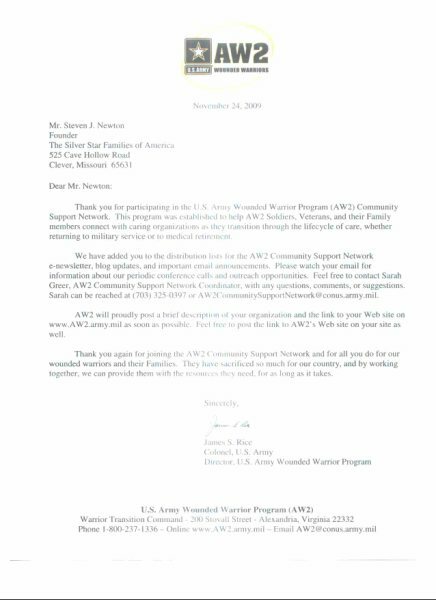 "I appreciate what you and your organization are doing for our wounded veterans,"
America Supports You has helped the Silver Star Families of America to become a trusted nonprofit that is known for accomplishing its goals. As a father of a son who served in the Marines including combat duty in Iraq, I experienced the ongoing concerns that all parents have about a grown child’s safe return from harm’s way. And while my son narrowly escaped injury and worse during his time in Iraq, knowing that Silver Star Families of America and other noble nonprofit organizations are there ready to help returning wounded troops is so important to all loved ones involved. "Thank you for your kindness and support. I really appreciate all of the cards and prayers that I recieve. Your support and encouragement helps to motivate me to get better. Thank you and Semper Fi"
"I just wanted to send you a quick heart felt note of thanks for sending me my Silver Star Banner which my wife proudly displays next to the Red Star banner. I am thankful for the support you give the troops and the Lord will bless you and those who help you in a mighty way, if there is any thing I can do please let me know. Newberg, Oregon , I found this site while reading a military news letter, and after reading the information, I believe this is a great way to recognize those of us wounded, or suffering from dibilitating injuries sustained in combat, to include Agent Orange, Gulf War Syndrom, etc. Keep up the great work. Lake Zurich, IL I think it's a great thing you are doing for those who have given - not the ultimate - but almost their whole lives, as they have to suffer with disabilities. They should be honored. They should be thanked. They should be remembered forever. They deserve this...... Who would think of denying it to them? North Carolina Thank you for thinking of a way to honor all our wounded warriors. Erie, PA This is something that is too long overdue. New Jersey I am a disabled veteran and believe people forget about the wounded who have had their lives completely altered by whatever injuries they have. Arlington, Wa Hi! I would like to see to it that my city becomes a supporter. I believe it will, given this opportunity. Norcross, GA This is a wonderfull idea, and want to see it passed ASAP, this is the least we can do for our brave men and women in harms way. Anderson, S. Carolina I am a retired U.S.Army veteran. Although I was not wounded in my time active, I know many of my fellow soldiers that were. I think this is a Great thing you are trying to achieve. Go get um', "hoo-rah" !!! God Bless America, and All the soldiers! Muskegon, MI It is a good idea to show support and recognize those members of our armed services who have served their country and the scars that will live with them the rest of their lives. I truly support the "Silver Star Banner"
Delray Beach, Fl. Wow what a great concept. Please feel free to call on us for any support you need here in fl, or in my home state of Ga. for political support. Look forward to helping to bring make this happen. Linton, Indiana I hope to see American Legion and Veteran Groups including the Silver Star Flag in their 4th of July Parades. Bedford, OH My son, a U.S. Army soldier was recently injured in an IED incident in Baghdad, Iraq. I feel that service members and their families should be recognized in this special way by receiving a Silver Star Banner for their sacrifices. Thank you for your support of our wounded veterans. God Bless you! Illinois As the sister of a Wounded Marine, OIF 2004, I fully support the Silver Star Banner and feel that it should be made an official Service Banner for the Wounded. I certainly hope that our congressmen and women would support our Wounded Heroes/Warriors and their families by passing legislation designating the Silver Star Flag and Banner as an Official Flag and Banner. If a Gold Star Flag and Banner are important enough to honor our Armed Forces who have died, why not have a Silver Star Flag and Banner to honor our wounded? Yes, there is the Purple Heart, but only the service member who was awarded this medal, or the lineal female decendants of those who are awarded, are permitted to become members of the MOPH or the LAMOPH. I am a sister who is proud of her brothers accomplishments in the Marine Corps and in overcoming his injury to move forward with his life. I would be proud to fly a Silver Star Banner at my home to remember not only him, but all of our Wounded Heroes and Warriors. Texas We fly the banner since our son has been with the 101st. This symbol should also be designated for the wounded warriors that so many take for granted. Indiana ARMAD radio I wish this drive the best. That Banner would be very nice to see. Keep up the great work. ARMAD support your group, and is proud to help get the word out about your projects. Thank You and all of our Military Members everywhere.